A Help Guide for Depression - causes, signs, treatment and sources of support. 'I feel depressed' has become a common expression to describe a low mood. But clinical depression is much more than feeling down or discontent now and then. Depression is actually a serious mood disorder that involves feeling sad and numb for weeks, months, or longer. Depression has a wide range of triggers and can be experienced in different ways by different people. For some, it is a one-off episode triggered by something obvious, while for others depression slowly builds from a series of smaller life challenges or occurs out of the blue and for no exact reason. Bringing with it many symptoms and challenges, depression can be quite debilitating and is not something someone can just 'get over' at will. But with the right treatment it is possible to make steps toward recovery. As well as there being different levels to depression (mild, moderate, severe) there are also different forms of depression. These include seasonal affective disorder (SAD), mixed anxiety and depressive disorder, and bipolar I disorder. 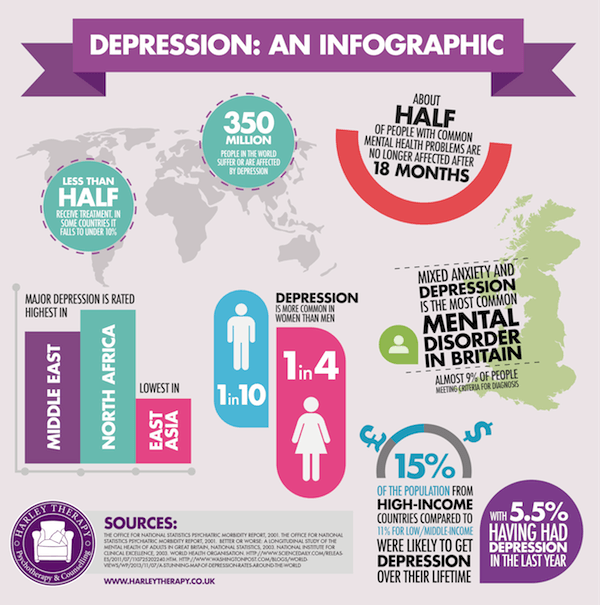 Depression, usually accompanied by anxiety, ranks as the most common mental disorder in the UK today. 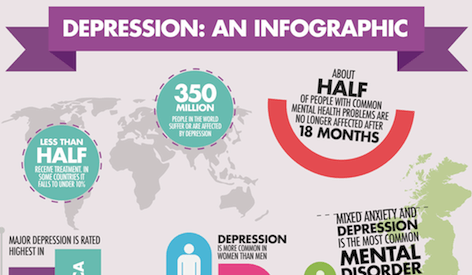 Up to 12% of the population are stated as experiencing depression in any given year. Researchers suggest that mild depression accounts for 70 per cent, moderate depression 20 per cent, and severe depression for 10 per cent of cases. Given that many individuals suffer low levels of depression without seeking help, it is possible total figures are even higher. Depression is most common in women and older people, where it affects 1 in 5. It is possible that statistics are underestimated for men and depression because they are less prone to report symptoms of common mental health challenges then women. If they do report issues they are more likely to be diagnosed with something like a personality disorder, where depression does exist but is a symptom. As for globally, the World Health Organisation (WHO) estimates a massive 350 million people are affected. While in the UK there is a strong infrastructure of support and services for those who suffer, in some countries less than 10% of people suffering depression receive treatment due to lack of trained providers or fear of being stigmatised for coming forwards. Depression can affect different people in different ways and to different degrees. It's important not to underestimate your symptoms just because someone else you know appears to have unalike or seemingly more challenging ones. While doctors do recognise varied levels to depression (mild, moderate, and severe) any depression at all is hard to manage by yourself and is something to take seriously and seek help over. If it is someone else you are worried about, it's important to recognise that many people hide their depression because of the stigma that unfortunately still exists, so a few noticeable symptoms might be signs of a much deeper issue. Depression is a very varied illness. For some people it might be something marked and obvious that sets off a depressive episode, like losing their job or being diagnosed with a serious illness. For others, depression can come after a build up of smaller challenges, like not getting a promotion at work, fighting with a friend, then having a birthday that ends with a '0'. And for still others, depression seems to happen out of the blue, for no exact reason. This leads to the common question about depression – is it environmental, psychological, or biological? Does depression happen because of challenging events, because we had a hard upbringing that made us unable to deal with challenging events, or because our very genes carry the tendency? For most people, it tends to be a mix of these factors. Early experiences do have a great influence on our long-term psychological health. Individuals who experienced a trauma at a young age are more likely to suffer low self-esteem, negative thought patterns, and difficulties forming bonds with others. This can all lead to ongoing mental challenges as an adult, including being more sensitive to stressful events then others. A challenging early life can also lead to poor self-care as an adult, which can be a contributing factor to depression. Substance use and abuse is linked to depression, including alcohol. Removing such depressants from your lifestyle can make all the difference. A poor diet may also be a contributory factor. And genetics have been linked to the development of depression. Research has shown that people with parents who have had depression have a higher chance of developing the illness themselves. Further research indicates that an imbalance of neurotransmitters in the brain is associated with depression. There is still speculation, however, as to whether this chemical imbalance is a cause or effect of depression. How can I be sure what I am suffering from is Depression? Low moods. It's normal to feel unhappy after a traumatic experience or unexpected challenge. It's when low moods go on far longer than normal, or our thoughts become far more negative than a circumstance requires or we start to think life will never be good again, that depression has been triggered. Grief. Losing a loved one is emotionally challenging for the best of us. Like depression, bereavement causes lack of sleep and appetite and a severe drop in mood. And grief can bring low-grade depression. But there are differences between grief and clinical depression. Grief is a healthy, normal process of sadness that comes in waves. It does not commonly brings suicidal intentions or the belief that life will never be good again, as depression does (although in some cases grief does then turn into clinical depression). Anxiety. Anxiety and depression usually come hand-in-hand, so if you have depression you are likely to also experience anxiety. But it is possible to experience anxiety alone and not alongside depression. If you experience fear and panic or constantly feel threatened, but don't have a sense of hopelessness and despair, you might only have an anxiety disorder. Stress. Extreme demands on your time and energy often bring low moods and a sense you can't cope, but if it only lasts a few days or a couple of weeks and you feel fine again it's likely just stress. If, however, you find the feelings last even after circumstances have resolved themselves, you might have developed depression. Loneliness. Humans are by nature social creatures. Low moods due to isolation might clear up quickly if social contact resumes. There is, however, an epidemic of loneliness that is unrelated to isolation and consists of an inability to feel connected to others that usually involves moderate to severe depression. Medicinal Side Effects. Depressive moods can be a side effect of many medications. It is worth checking the patient information leaflet of any medicine being taken if you are concerned. Some examples of medication that can cause low moods include corticosteroids, benzodiazepines, Levodopa, Reserpine, beta blockers and certain cancer chemotherapeutic agents. Health Issues. Health issues that may cause low moods include hormonal problems (especially thyroid and parathyroid), menstrual cycle issues, menopause, dementia, low blood sugar levels, sleep problems and severe head injuries. How long does it take to get over Depression? Again, it's a case of being unique to the individual. It's possible to just have one big depressive episode that with treatment such as talk therapy you recover from in six months to a year. This is more likely if your depression is a natural response to a sudden and unusual life change or challenge (like losing a job or being the victim of a crime) and isn't accompanied by psychological or biological factors. But for many, depression is a recurring issue that has to be dealt with repetitively and can take time to recuperate from. The World Health Organisation (WHO) found that at least 50 per cent of people, following their first episode of major depression, will then go on to have at least one more episode. Furthermore, after the second and third episodes the risk of relapse rises to 70 per cent and 90 per cent respectively. Like with many psychological health conditions, depression tends to be misunderstood, both in its causes and its treatment. There has traditionally been an idea that depression is something to be ashamed about, when really it is a very common problem that is not related to anything the individual has or hasn't done and is not within their control or a choice they have made. Sadly there has also been a stigma against seeking help. Some still feel that admitting to depression and seeking the assistance of a psychotherapist or counsellor is a sign of weakness, while in fact the opposite is true. Seeking help for depression is a sign of personal strength and self-awareness. Diagnosis for depression involves a healthcare professional, such as your GP or a psychotherapist, asking you a set of questions. The diagnosis is made according to the number and severity of your symptoms as well as how the way you have been feeling is affecting your life, thoughts, and physical health. The more open and honest you can be the better your chance of an accurate diagnosis. If you are worried or curious about how a diagnosis of depression is made, you might want to read the guidelines set forward by the National Institute for Health and Care Excellence (NICE). NICE works to maintain a set of specific, concise statements that healthcare professionals can refer to to maintain quality standards for patient care. You can visit their website for more information or read their reference guide to depression here. The recommended treatment will depend on the individual – how depressed they are, why they are depressed, and to an extent their personality (while one person might respond well, say, to group counselling, another might find one-to-one sessions suit them better). The severity of your illness will determine a path forward, which can vary from counselling sessions to, in extreme cases, hospitalisation. You may be given an assessment such as the Hospital Anxiety and Depression Scale [HADS] or the Beck Depression Inventory [BDI]) during initial assessment which will identify important factors and help with treatment planning. As the causes of depression can be biological, environmental and psychological the treatment given will need to reflect this. For example, an imbalance in neurotransmitters may be treated by medication that aims to balance these brain chemicals. There are many antidepressants available and these can be prescribed by your GP or psychiatrist. You should be aware of the side effects that your prescribed medication has. It is also important to consider alternative ways of treatment such as talk therapy rather than relying solely on medication. For many, talk therapy is in and of itself enough of an intervention. There are many different kinds of therapy available, and the kinds on offer will depend on the organisation or clinic you choose to access. You can first choose whether you are seeking individual therapy, or if couple, family, or group counselling suits you. You can also access a combination of these, such as attending individual sessions weekly and family sessions once a month. Then you can choose from a range of evidence-based approaches, that include but are not limited to: cognitive therapy, cognitive behavioural therapy, problem solving, counselling, behavioural activation, rational emotive behavioural therapy, interpersonal therapy, mindfulness and psychodynamic therapy. It's important to remember that depression tends to be a recurring issue, and treating depression is most effective if it dealt with like an illness such as high blood pressure or diabetes. In other words, although it can be tempting to cease treatment if you suddenly feel better, it's advisable to have an ongoing relationship with a mental health professional that involves ongoing maintenance. This helps lessen the likelihood of a major relapse. What is the risk if Depression is untreated? Some people will only ever experience one episode of depression which will pass in a short time. Many others, however, will suffer depression a long time and can experience a number of episodes which can lead to further health risks if left untreated. This can include eating disorders, self-harm, sleep disorders and suicide attempts. There is now also a wealth of evidence that depression can lower the immune system, which can then lead to medical illnesses. It's important to realise that depression is indiscriminate and can affect anyone, from any background. Celebrities who have been suggested to have suffered depression include Princess Diana, Victoria Pendleton, Angelina Jolie, Bob Dylan, Janet Jackson, Marilyn Monroe and J.K. Rowling. If you suspect you are suffering from depression it's important to find the help you need. Here are various resources you might find useful. A Guide to Rational Living. Albert Ellis. There are many trained professionals who will be able to support you such as counsellors, psychotherapists, psychologists and psychiatrists. Counselling and psychotherapy clinics - search through online directories for one in your area. Harley Therapy is one such private practice in London, UK that can assist with depression treatment. Most workplace insurances now cover visits to a therapist, enquire with human resources at your organisation. The NHS - an alternate to a private practice in the UK is seeing your GP and asking for a referral to a specialist. Mental Health Charities - organisations such as MIND, Rethink, Young Minds, Mental Health Foundation and National Self Harm Network may provide support groups, therapy and advice in your local area. You might want to call your local council to enquire about such organisations in your area. You might also find our guide to low cost counselling useful in your search. Alderman, T. (1997) The Scarred Soul: Understanding and Ending Self-inflicted Violence. Oakland, CA: New Harbinger Publications. Bergen, H., Hawton, K., Waters, K., Ness, J., Cooper, J., Steeg, S., Kapur, N. (2012). Premature death after self-harm: a multicentre cohort study. Lancet. 3, 380. Boyce, P., Oakley-Browne & Hatcher. (2001). The problem of deliberate self-harm. Current Opinion in Psychiatry. Vol 14 (2) 107-111. Claveirole, Anne; Martin Gaughan (2011). Understanding Children and Young People's Mental Health. West Sussex, UK: John Wiley & Sons. Fox, C., Hawton, K. (2004). Deliberate Self-Harm in Adolescence. London: Jessica Kingsley. Hawton, K., Townsend, E., Arensman, E., et al (2003). Psychosocial and pharmacologial treatments for deliberate self-harm. Cochrane Methodology Review. (Cochrane Library, John Wiley) Issue 3. Hollander, Nock &Teper (2007). Psychological Treatment of Self-Injury Among Adolescents. Journal of Clinical Psychology: In Session. Vol. 63 (11), 1081–1089. Kettlewell, C. (2000). Skin Game. New York: St. Martin's Griffin. Klonsky, E. D. (2007). The functions of deliberate self-injury: a review of the evidence. Clinical Psychology Review 27(2): 226–239. Klonsky, E. D., Oltmanns, T. F., and Turkheimer, E. (2003). Deliberate self-harm in a nonclinical population: Prevalence and psychological correlates. American Journal of Psychiatry. 160(8): 501–1508. Laye-Gindhu, A., Schonert-Reichl, Kimberly A. (2005). "Nonsuicidal Self-Harm Among Community Adolescents: Understanding the "Whats" and "Whys" of Self-Harm", Journal of Youth and Adolescence 34 (5): 447–457. National Institute for Clinical Excellence (2004). National Clinical Practice Guideline 16: Self-Harm. The British Psychological Society. Putnam F., & Trickett, P. (1997). Psychobiological Effects of Sexual Abuse. Annals of the New York Academy of Sciences. (Psychobiology of Posttraumatic Stress Disorder) 821, 150-159. Sutton, J. (1999). Healing the Hurt Within: Understand and Relieve the Suffering Behind Self-destructive Behaviour. Oxford: Pathways. © 2006-2019 Harley Therapy™ • Psychotherapy & Counselling.